A lady will never charge entrance to her garden but will rather invite in each and every passer-by and take joy in the pleasure they find therein. Many ladies take delight in visting each others' private gardens. The following is taken as extracts from the "A Guide to Lady Gardening - An Victorian Lady's Companion" by Mrs Francis "Fanny" Plucker (originally published in London in 1863 as "The Dictionary of Daily Wants") as a part of the same series as Tropical Zones - A Guide to Understanding the Dry and Wet Seasons within the Forested Equatorial Regions, both of which would go on to be popular and well thumbed favourites amongst polite society. 2 Perform every operation at the proper season. 3 Perform every operation in the best manner. 4 For every job, its season. 6 Keep every part perfect in its kind. 7 Restricting access to one's area to garner maximum advantage. 8 Take pleasure within your garden. Perform every operation at the proper season. Each bush flowers naturally at the time and season for which it was designed. Every lady wishes her foliage to be the delight of her neighbours, but to trim beyond God’s intentions may harm her prize possession. Ladies must ever be vigilant lest unsharpened tools forever despoil the neatness in which she takes pride. Younger gentlemen callers may require extensive guidance to locate a lady's clematis on first aquaintance. But persevere, as its location can lead to endless stimulation. Perform every operation in the best manner. This is to be acquired in part by practice, and partly also by reflection. For example, rough-handed “rummaging” may give relief after long Winter months of inaction, and it is a common practice with slovens to throw aside what is plucked from her garden with the intention of gathering it thereafter. How often, however, have we seen a rude pile of shapeless, discarded shrubbery defiling what would otherwise entrance? How much better to have a wheelbarrow, or, if that cannot be had, a large basket, into which to put such extraneous growth, as it is excised. Remember to wash your hands thoroughly after tending to your plot, after being knuckles deep in the soft loam it is important to wash off any residue so not as to gain an unwanted infection. Where your actions may require working with coarser materials it is advised that suitable protective items should be worn. For every job, its season. Mrs F. Plucker, circa 1832. This is an essential point in any lady’s gardening operations; and though it cannot always be attended to, partly from the nature of the operation, partly from the weather, &c., yet the judicious lady gardener will keep it in view as much as possible. Suppose one’s allotment requires to be stirred by the Dutch hoe and the undergrowth raked off. 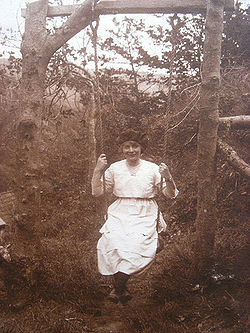 If the weather were certain of holding good for two days, a lady might take her ease in the sunshine and, on the principle of the division of labour, would certainly be somewhat economical in her mode of working, not rushing to complete a task before asking her husband’s advice, or awaiting her gardener's proposal. But supposing it be wet, the plot left part-hoed and not raked will for a time appear unfinished. Better, therefore, to seek advice from one’s clergyman in engaging local boys who could be engaged for a few pennies to help tidy one’s area. Finish one job before you begin another. The embarrassment of an untidy garden if one has invited other ladies round for swinging can only be imagined. This advice is trite, but it is of great importance. No lady who values her husband’s peace of mind will willingly leave a job undone only for him to discover on his leisure day untidy hedging, and topiary left unattended where previously he had found enjoyment amongst well-trimmed verges. Some are tempted to hastily squeeze as much as possible into a small plot, with little thought as to the outcome. Careful planning and preparation should always be at the forefront of your thinking. In desisting from working at any job, leave your tools in an orderly manner. Many ladies enjoy hoeing vigorously between the furrows but on becoming fatigued do not throw down your tool face upwards, or across the furrows. Lay your implement down parallel to the furrows, with its face to the ground. Men have been grievously injured by such devices left scattered within a lady’s area. Keep every part perfect in its kind. A multitude of devices may be found to allow ladies to enjoy their gardens without the labour of their husbands. Attend to such machines with care; see particularly that they are stored in their proper situations unaffected by the caprices of the climate, and where children may not find and injure themselves therewith. A cautious lady will keep said tools well oiled, ready for her usage at a moment. Hedge-trimmers - Keeping an unslightly hedge trimmed allows for easier access to other parts of a Lady's garden. Garden Fork - A good forking will help to maintain the fecundancy of your garden. Remember to hold the shaft firmly to avoid muscle strains. Spade - Some Ladies, particularly those within the Americas and in the more tropical parts of the Empire, may occasionally employ a spade for heavy work. Garden Hose - Regular hosing helps in keeping your petals moist and your plot damp, particularly during the warm summer months, as is important to assist in the sprouting of new growth. Remember to hold the nozzle gently but firmly to allow more control of the flow, from a slow dribble where necessary through to a powerful blast when a major soaking is required. 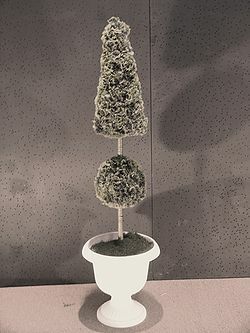 Imaginative topiary can bring joy, but the vulgar must be avoided at all times even in the privacy of one's own home. Restricting access to one's area to garner maximum advantage. No unmarried lady should ever invite a gentleman to view her private grounds without her Father’s knowledge or before they have been prepared correctly. The impression made upon the minds of single gentlemen when a lady presents her garden in a disorderly state will surely put thoughts of matrimony to the farthest extremes of his mind. Equally, take care not to excite a gentleman beyond reason with too open a view. Instead, invite him to take tea and sit him where he may take discrete observation of your intimate grounds, leaving him with the desire to return at a later date to examine them at greater length. A leisurely stroll through your garden, gently taking your paramour in hand is a way for you to share a special moment, showing the gentleman all the secret treasures to be found within. Take pleasure within your garden. 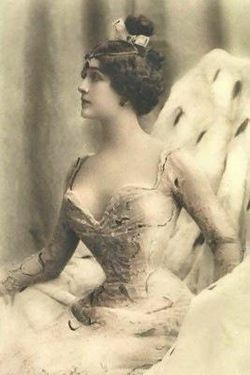 Most importantly, whether with company or alone, a lady should always take pleasure in her garden, admiring the gentle slopes of grassy knolls, the smooth lines of a neatly trimmed hedge or the heady fragrance which accompanies the burst of colour during the flowering of her prize assets. Lady gardening is a pastime which may be enjoyed throughout your life, and will provide gentle exercise as well as maintaining a healthy glow and rosy cheeks.